This semester I participated in the University of North Carolina’s Outer Banks Field Site and had the honor of interning with the federation’s Northeast office in Wanchese, North Carolina. I spent most of my Mondays and Wednesdays at their beautiful office in Wanchese in my personal office (they take really good care of their interns) that had a beautiful view of the sound. As a native of Shelby, North Carolina, I was much more familiar with more mountainous environments before interning at the coast. Much of my internship was spent with my amazing mentor, Sara Hallas, who is the Coastal Education Coordinator for the Northeast office. I especially appreciated the opportunity to work with Sara because I rarely have an opportunity to work with kids in a way that is relevant to my career as a pre-law student. Sara and I traveled to middle and high schools across Dare County and hosted students at our office to teach them about water quality and the value of rain gardens. I even got to travel with Sara to Elizabeth City, NC, for a day spent working with the River City Youth Build. There, Sara gave a lesson on water quality, while I got to talk a little bit with the students about my collegiate experiences and future professional plans. I also got to take part in a restoration project at Festival Island Park, where we dug a new rain garden and planted several native plant species! The vast majority of my work, however, was in assisting the federation with their Lost Fishing Gear Recovery Project. Started in 2014, the Project enables the federation to hire commercial fishermen to collect lost crab pots during the no-potting period from January 15 until February 7. In 2018 alone, 76 fishermen collected 3496 crab pots (or 1.7 tons of debris) along the North Carolina coast! From the collection, 2413 blue crabs and 761 fish were released from the lost pots. My main focus for this project involved what to do with the collected crab pots once they are taken out of the sound. My goal was to evaluate the costs and benefits of selling and reusing the crab pots, rather than scrapping them for the value of their steel as done in previous years. 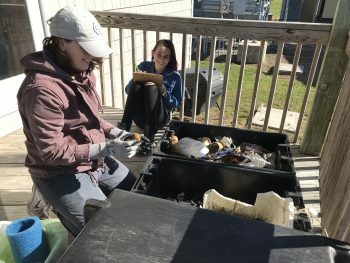 I consolidated all the available data on previous crab pot scraps in the Northeast in order to evaluate the value of gear lost and the costs associated with replacing the lost gear. In this process, I did extensive research on the legality of selling the collected pots or even using them as payment for the hired fishermen. By conducting legal research, I summarized the current policy relevant to crab pots collection and suggested ways that these policies may be interpreted or changed to benefit the federation in the future. Overall, my internship at the federation has been incredibly rewarding. 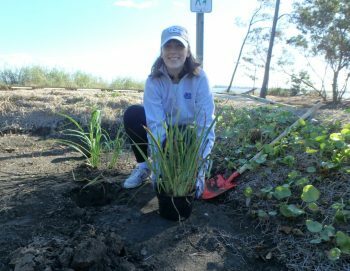 If you live along the coast or love the ocean, consider becoming a member or attending one of their fun oyster roasts, happy hours or other fundraising events. If you are as interested and passionate about coastal issues as I am, consider interning here. With opportunities in politics and lobbying, coastal science, education and non-profit management, the federation has something for everyone!